Country retreats provide the perfect escape from the drudgery of daily routines and allow us to reconnect with nature and each other. However, finding the ideal accommodation for your rural escape is no easy feat. That’s why we’ve put together this guide to help you make the most of your weekend away. 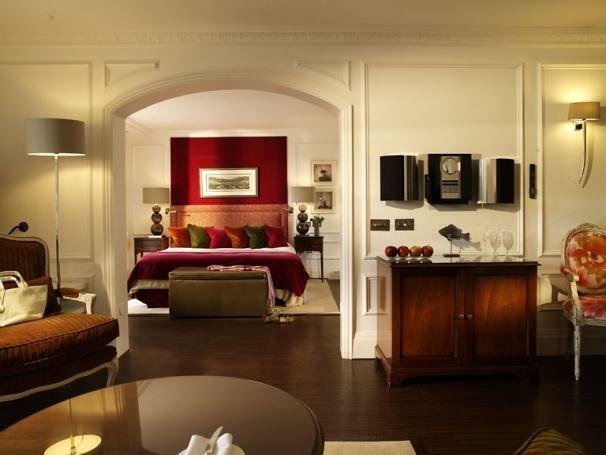 The privately-owned Chewton Glen Hotel is a quintessentially English luxurious country estate. The Chewton Glen estate dates back to the 12th century and includes more than 130 acres of woodlands, glens, and parklands, which guests have direct access to. The Chewton Glen Hotel is also located within close proximity to the New Forest and the ocean so there are plenty of nearby nature walks. Best for: From woodlands to glens to beaches, the Chewton Glen Hotel offers direct access to many hiking trails. As the hotel is within walking distance to the ocean, guests can also choose from many different water-based activities or simply sun lounge on the beautifully manicured gardens. Style & Size: Each of the 70 rooms exudes luxury and attention to detail, which ensures that guests are comfortable after long walks. For a truly unique nature experience, there are twelve high-end tree houses. The tree houses are suspended thirty-five feet above the ground and feature hot tubs, wood stoves, and excellent views. Food & Drink: Dishes from The Kitchen at the Chewton Glen Hotel are guaranteed fresh as they are sourced from local producers or grown in the onsite kitchen garden. Guests can also join cooking lessons with lead chefs or enjoy the extensive wine list. Spa Facilities: After a long day of exploring the great outdoors, the Chewton Glen Hotel has the perfect facilities for easing sore muscles with its twelve treatment rooms, a 17m swimming pool, fitness studio, dance studio, sauna, steam room, nail studio, hydrotherapy, and hot tub. Other Facilities: Additional highlights include 50 working beehives, tennis courts, nine-hole golf course, and many leisure activities (from archery to duck herding). Experience a true country retreat at the Gidleigh Park Hotel in Devon. The Gidleigh Park is located on the edge of Dartmoor National Park and as such provides exquisite access to the great outdoors. Plus, the Gidleigh Park Hotel, with its beautifully furnished rooms and Tutor-style architecture, ensures luxury and comfort. Best for: Experiencing the peacefulness of the moorlands in comfort and style. Style & Size: Each of the twenty-four bedrooms has been individually designed with a concentration on luxury and true English style. Most of the rooms have views over the nearby river. Guests wanting a more secluded stay should check out the Pavilion, a thatched cottage located a short distance from the hotel beside the river. Food & Drink: The two-starred Michelin restaurant sources most of its fruits and vegetables from the kitchen garden to provide the freshest dishes possible. For those looking for something lighter, the afternoon tea is a great mid-day snack after exploring the local surroundings. Gidleigh Park also features an internationally renowned wine cellar with over 13,000 bottles, which are the perfect accompaniment to the excellent food. Spa Facilities: While Gidleigh Park does not include a spa, guests can book a variety of treatments. Other Facilities: The Gidleigh Park includes 107 acres of grounds with a unique water garden and kitchen garden, 18-hole golf course, outdoor tennis courts, croquet lawns, nearby hiking trails and fly fishing, and kitchen facilities. Inverlochy Castle as a 19th century castle is unique accommodation. It is set amidst some of Scotland’s most dramatic and breathtaking scenery. Located only a short drive from the Glencoe mountains and foothills of Ben Nevis, Inverlochy Castle is a truly Scottish experience. 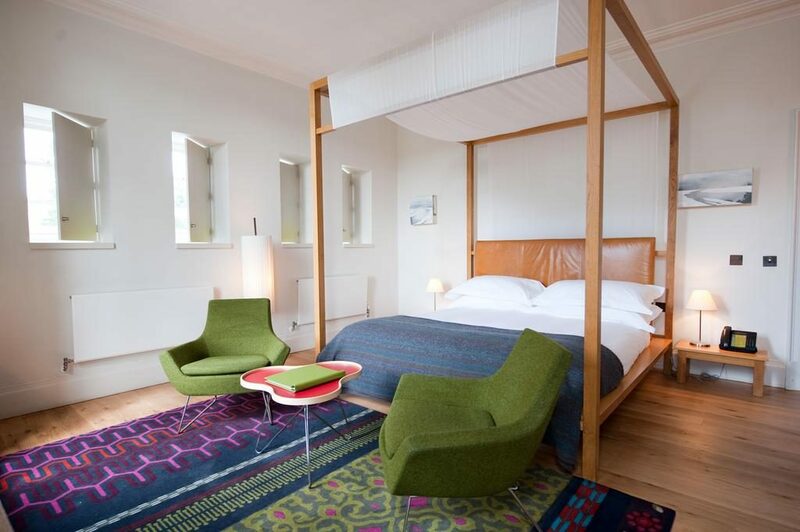 Best for: An idyllic country retreat within the dramatic Scottish highlands. 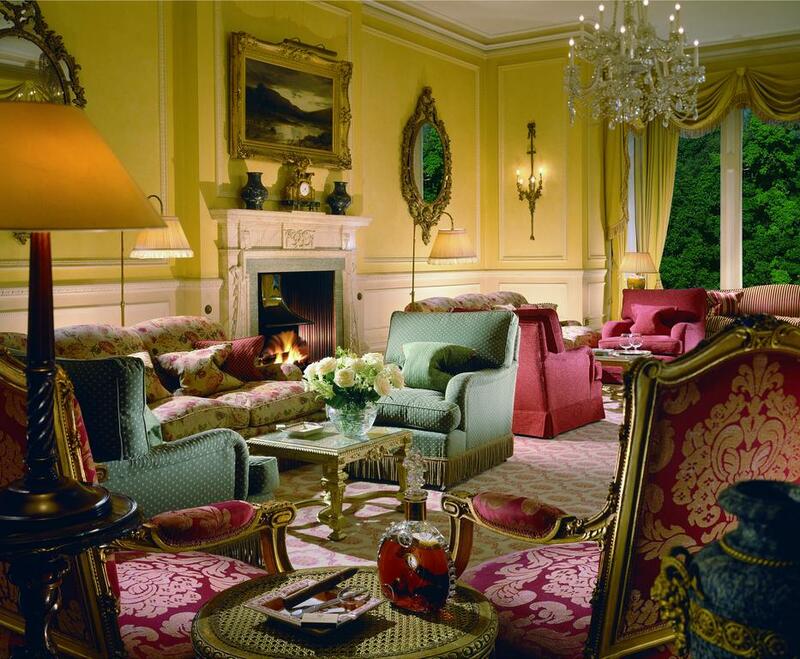 Style & Size: Inverlochy Castle is a relatively small hotel as it only features seventeen rooms. 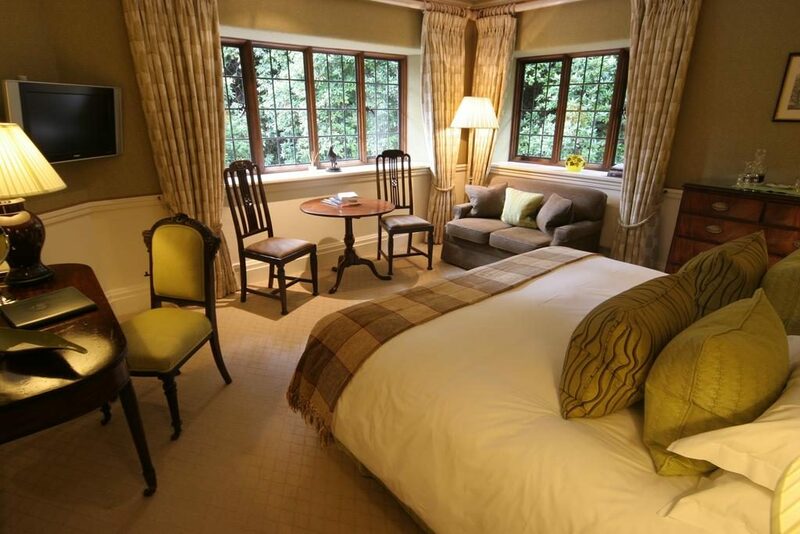 Each of the seventeen rooms is decorated in true Scottish elegance and look over the grounds or nearby hills. Food & Drink: The Albert and Michel Roux Jr. restaurant provides an upscale culinary experience. Savour every mouthful from the delightful father and son team as they produce locally-sourced dishes. Their culinary expertise has been recognised with the AA 3 Red Rosettes award. Other Facilities: Inverlochy Castle can organise a range of outdoor activities including hunting, fishing, sporting, whitewater rafting, and more. Without leaving the grounds, you can access 55 acres of parkland, woods, meadows. 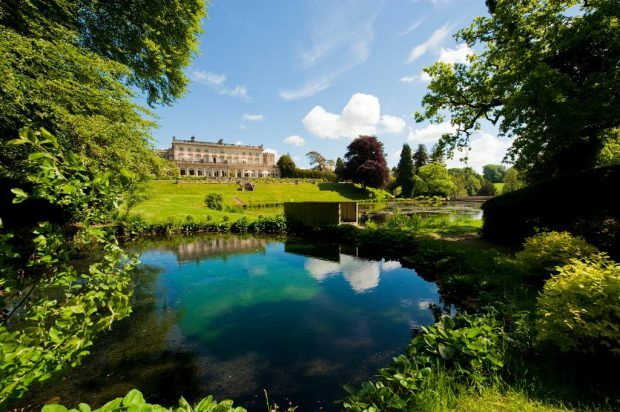 The gardens at the Cowley Manor include natural springs, lakes, and Victorian cascades. Plus, with its emphasis on comfort, luxury, and service, Cowley Manor is the perfect rural escape. Best for: Direct access to nature without leaving the hotel grounds. Style & Size: Its 30 rooms all feature modern design that creates an airy and spacious atmosphere. The furniture and fabrics have been handmade by British designers. Food & Drink: Dishes at Malt emphasis sustainability and innovation, which celebrate England’s eclectic culinary influences. Produce is locally sourced from England’s South West regions. Spa Facilities: The award-winning spa includes a heated 17m indoor pool, heated 15m outdoor pool, steam room, sauna, gym facilities, and four treatment rooms offering the full range of therapeutic treatments. Other Facilities: Additional facilities include a billiard room, study, terrace, 55 acre gardens, and outdoor theatre (summer only).